Lasse Klein’s limited edition Alien Abduction Lamp features a laser engraved signature on the lamp and a specially printed certificate poster. The lamp comes complete with a glowing alien crew and real fake grass. The antenna function as the on-off switch and can also enable light pulsation. 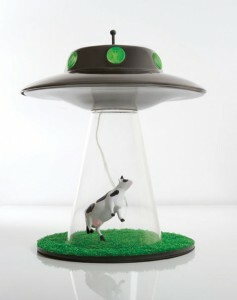 And of course, the cow can be removed so that you can place any figure or object that you want to have abducted in the beam. At $100 a pop, the lamp isn’t cheap, but it is slick. For those not creatively challenged, Dollar Store Crafts shows how you can Make an Alien Abduction Lamp for about five dollars.